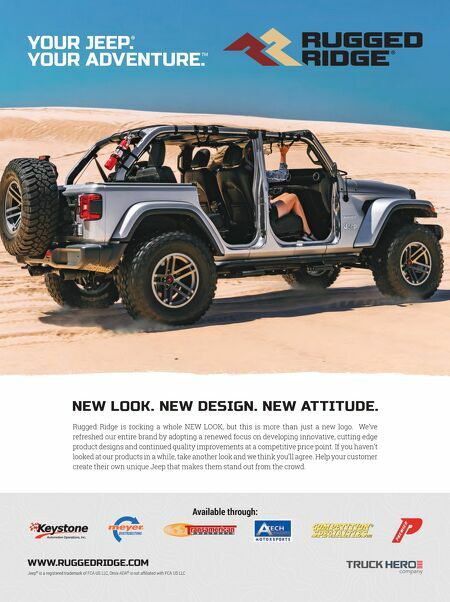 64 THE SHOP APRIL 2019 \\\\\\\\\\\\\\\\\\\\\\\\\\\\\\\\\\\\\\\\\\\\\\\\\\\ \\\\\\\\\\\\\\\\\\\\\\\\\\\\\\\\\\\\\\\\\\\\\\\\\\\ ne of the most recognizable modes of public transportation in America is set to be refreshed. The Glacier National Park Red Bus Fleet, which debuted at the popular Montana tourist attraction in 1936, will be converted to electric hybrid systems by Legacy Classic Trucks of Driggs, Idaho, as part of a total fleet overhaul. The company specializes in restoring and modernizing vintage American vehicles. Work has included 1930s Yellowstone buses, a Mt. Rainer bus and more than 100 classic Dodge Power Wagons. "We are honored to be entrusted with such an iconic slice of Americana," said Winslow Bent, Legacy Classic Trucks CEO. "When people think of classic American public transportation, the Gla- cier Red Bus Fleet is in the same class as the San Francisco cable cars. By updating the buses to an electric hybrid system, they will have a much lower carbon footprint in Glacier National Park. Regenerative braking will charge the batteries during downhill descents." The White Motor Co. Model 706 buses were put into service from 1936- '39. The fleet was last updated between 1999-2002 via a collaboration with Ford, which included the automaker adapting the bus bodies to E-series van chassis and propane systems. Since then, each bus has logged between 130,000 and 150,000 miles, averaging 10,000 miles each year. Legacy Classic Trucks will restore and update each bus in the fleet during the park's off-season months as part of the multiyear project. Each bus will get a new Ford chassis and Ford 6.2-liter V-8 engine. The powertrain will be bolstered by a pass- through hybrid electrical system that will increase fuel economy and lower emissions by up to 25 percent. Legacy will also upgrade to 19.5-inch- tall wheels to replicate the original 1930s units. Similarly, retro-looking gauges will be added to give the buses a period-correct appearance. Bus bodies will undergo rust repair and be repainted on an as-needed basis. 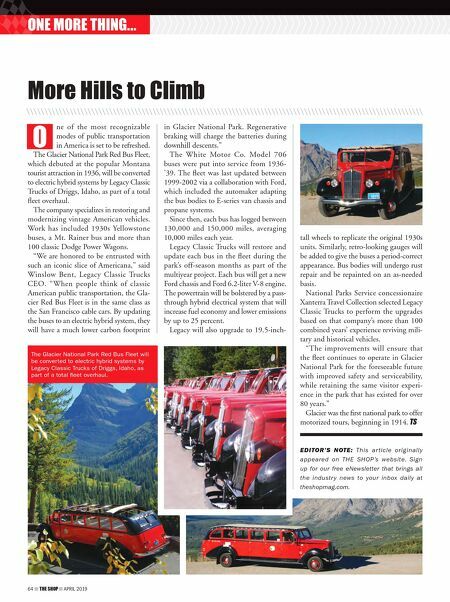 National Parks Service concessionaire Xanterra Travel Collection selected Legacy Classic Trucks to perform the upgrades based on that company's more than 100 combined years' experience reviving mili- tary and historical vehicles. "The improvements will ensure that the fleet continues to operate in Glacier National Park for the foreseeable future with improved safety and serviceability, while retaining the same visitor experi- ence in the park that has existed for over 80 years." Glacier was the first national park to offer motorized tours, beginning in 1914. EDITOR'S NOTE: This ar ticle originally appeared on THE SHOP's website. Sign up for our free eNewsletter that brings all the industry news to your inbox daily at theshopmag.com. More Hills to Climb O \\\\\\\\\\\\\\\\\\\\\\\\\\\\\\\\\\\\\\\\\\\\\\\\\\\\\\\\\\\\\\\\\\\\\\\\\\\\\\\\\\\\\\\\\\\\\\\\\\\\\\\\\\\\\\ ONE MORE THING... The Glacier National Park Red Bus Fleet will be converted to electric hybrid systems by Legacy Classic Trucks of Driggs, Idaho, as part of a total fleet overhaul.